Last week we announced 4 new features to enhance our user’s in-app experience. These features make the app more robust for frequent users (“Auto Replenish”), visitors/infrequent users (“Pay-As-You-Go”), all users (“PayTollo Now™”) and everyone wins with the new “Invite Friends” (earn $5 toll credit by inviting your friends!). This article will describe the two new payment plans “Auto Replenish” and “Pay-As-You-Go” AND how to settle your account immediately using “PayTollo Now”. Are you a heavy commuter? 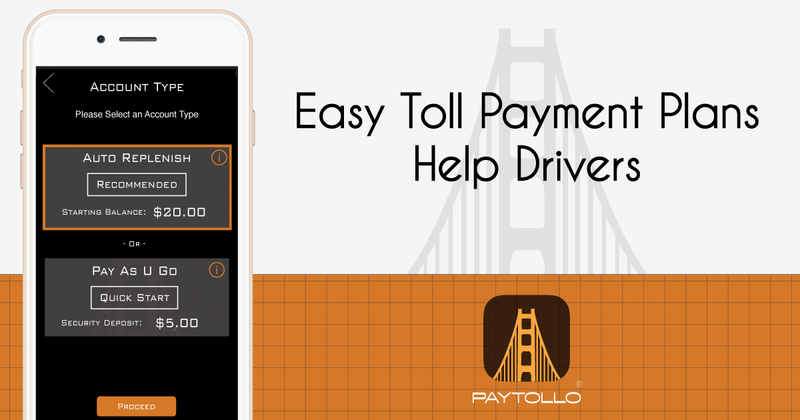 Start your PayTollo account with a $20 balance and we will auto replenish your account once you hit a $5 threshold. Auto replenish account works best for family with multiple vehicles and drivers. Tie all vehicles to 1 payment option and family members can share login credentials. Stop worrying about receiving multiple violation letters in the mail or purchasing multiple transponders for each vehicle. Simply download the app, register multiple vehicles to your account and start driving. When using the app, make sure to have the correct vehicle selected on your dashboard. Are you the occasional driver or out of state visitor? Pay-As-You-Go does not require an account balance, instead you can choose an optional $5 deposit as a safety if your credit card expires or declines. This account type has convenience fees applied at each toll bundle and is good for the casual toll user. PayTollo assists you with minimal convenience fees by our bundled payments model. How does it work? Once your first pending toll crossings auto-settle with the toll agency or you “PayTollo Now”, we initiate a pre-authorization of $20 on your account for up to 96 hours and bundle up to $20 worth of toll crossings. At the end of the time period we close out the transaction with 1 convenience fee charge. We are excited about our “PayTollo Now” feature, this enables users to manually confirm toll crossings direct from the Pending screen. No need to wait for toll agency for auto-settlement you can now do it yourself. We even added Multi-select capabilities which allows you to select multiple toll crossings from your drive, for example an On Ramp, Mainline Plaza and Off Ramp to your drive to work. This feature further enables our mission to GPS based tolling process. We are dedicated to providing the best experience within our app. You as a user can also be part of the team! To suggest app features, changes or ideas, please feel free to reach out to us on feedback. You can reach out to us via the app, website or our social media channels Facebook, Twitter, Instagram, LinkedIn.